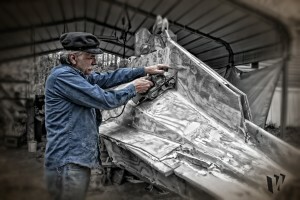 Captain Mobius is just your average everyman: he’s fifty-something, retired with a partial physical disability… and he has a mission: you see, he’s recreating the Nautilus from Walt Disney’s ‘20,000 Leagues Under the Sea’ as a 36-foot, 5 passenger lake-going boat, and doing it single-handedly. In a recent conversation from an undisclosed location somewhere in Georgia, Captain Mobius explained his manifold motivations for the Nautilus Project. The seed was planted in 1962, when his father took the then 6-year-old Captain Mobius to see Disney’s ‘20,000 Leagues Under the Sea’. “I would make believe I was every character in that movie except the giant squid,” he chuckled reflectively. This early experience fostered life-long loves of both science-fiction and the sea. He taught himself to sail by age 30, scratch-building several sailing vessels over the years. Had ‘The League of Extraordinary Gentlemen’ movie not been released in 2003, the Nautilus Project might never have happened. The CGI imagining of Nemo’s massive Nautilus in that film was an affront to Captain Mobius. CGI had freed film-makers from respecting physical laws, and Captain Mobius felt that version of the Nautilus was just all wrong. “The great movie model-makers are all gone. At least they made things look like they’d work!” Perhaps we should be thanking them for providing the impetus for the Nautilus Project. So Captain Mobius started to work, designing with pencil, ruler and paper his homage to the only rightful movie Nautilus, the 1954 masterpiece made by Harper Goff for the Disney production. He spent three years planning every detail and every stage of the construction, using only techniques available to the average, self-educated person (like him). He’s accomplishing this feat of nautical engineering using only hand tools and materials available at the local home improvement store. “There is no piece of lumber more than 16 inches wide because I had to move them all in a Toyota Sentra”. Pyrex bowls have been pressed into service for the semi-submerged hemispherical viewports on port and starboard. When complete, the wooden structure will be sealed in a fiberglass skin before being cunningly painted to match the original Nautilus. The good Cap’n Mobius doesn’t consider this his final project, by any means. He has more fantastic vessels planned, but alas, those plans are still top secret! The Nautilus is slated for launch in a gala ceremony in late July, near Atlanta. Keep tabs on the Nautilus Project via Facebook (www.facebook.com/TheNautilusProject) or follow them on Twitter @NautilusAtlanta. “There is no piece of lumber more than 16 inches wide because I had to move them all in a Toyota Sentra”. It is a Dodge Neon, not a toyota sentra. I know this because I own the car. Capt. Mobius and the crew of The Nautilus Project wanted to extend our sincere thanks to Prof. Offlogic and SPM for giving us the honor of gracing their fine website. We were so excited that you were interested in our project and are grateful for a platform to help spread the word of our project. To help with the build go to this web address to donate. The Nautilus Project FB page, as sited in this article is no longer directly affiliated with Danny McWilliams (formerly Captain Mobius) and the building of the replica of the Nautilus. We will continue to share in his progress with the fans we have garnered for him and will continue to follow his build through Winnward’s photography and video. We wish him well on his one-man voyage to fame and fortune. I have not posted here before ,and thought its about time I do.